IT was quite a bizarre day at RAMS Arena, with all 12 teams coming together to face off in a fantastic ‘Super Saturday’ of matches. 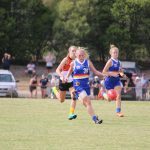 For the final AFL Draft Central TAC Cup Girls’ Team of the Week, we find the highest ever number of players from a losing side making the team. The Western Jets were well beaten by the Geelong Falcons, but their top three players stood out so much in the wet that they earned places in the Round 9 Team of the Week. Remarkably, their opponents, the Geelong Falcons also had three players in the team. Conversely, despite winning their match well, the Greater Western Victoria (GWV) Rebels had just the one player in the team – mainly due to the fact it was hard to split such an even contribution. For Western, it was their highest number of representatives for the year, with regular nominees Elisabeth Georgostathis and Isabelle Pritchard and making the team for the fifth and fourth time respectively. But a fresh face to the team was ruck Taylah Kolevski who was ultra-impressive around the ground and at the stoppages in wet conditions. On the opposition side, Olivia Purcell collected her fifth Team of the Week nomination, joined in the side by Nina Morrison and Sachi DeGiacomi who are both no stranger to making the Team of the Week – both named four times. 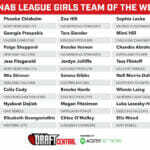 Six of the remaining 10 teams had two nominees in the side, with Northern Knights’ Ellie McKenzie making a remarkable sixth Team of the Week – sitting third overall on most nominees. She is joined in the team by debutant in the side, Ashleigh Snow in the back pocket. Of the two with more nominations than McKenzie, they are fairly handy players in Madison Prespakis and Tyla Hanks – both making it eight out of eight games played. Their respective teammates at Calder Cannons, forward Georgia Patrikios and Power half-back Emily Haeusler have made it for the third and fourth time respectively. In the back pocket is Sandringham Dragons’ Alice Burke who makes it for the third time, along with now two-time nominee forward Isabella Eddey. Rounding out the defence on the flank is GWV Rebels’ captain Lauren Butler who is the sole Rebel in a rather unlucky round given Rene Caris was one of many ruck choices in a week where plenty of key position players stood tall. But she was not the only one, with Sophie Molan also deemed impressive in the wet and would be an emergency in the round’s Team of the Week. 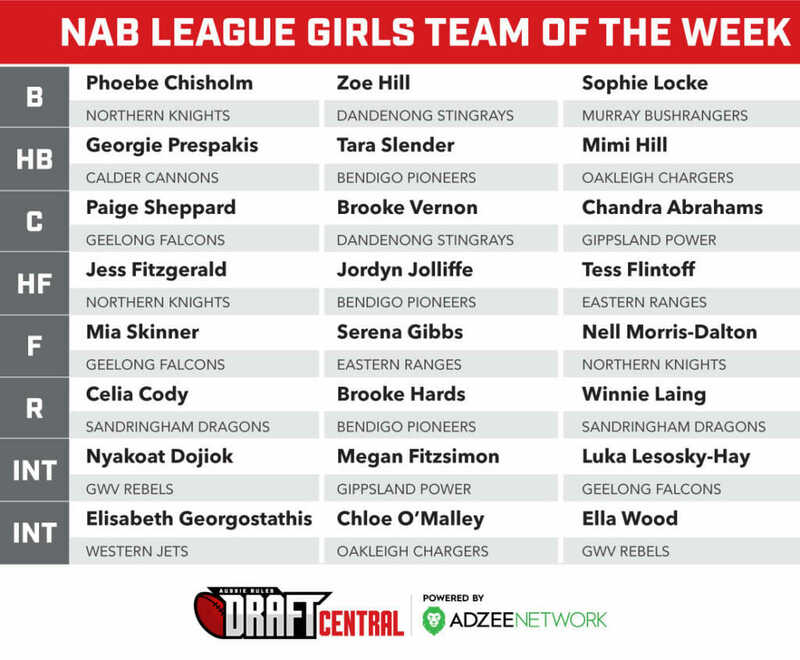 The remaining starting midfielder in the Team of the Week is Kodi Jacques, who for the first time is joined by fellow Bendigo Pioneers hard nut Megan Williamson. The pair have almost exclusively held a spot in the best 22 throughout the season, with Jacques (now five nominations) and Williamson (four) both impressing despite Bendigo’s loss to Dandenong Stingrays. Speaking of the Stingrays, Isabella Shannon returns to the Team of the Week, joining Courtney Jones, who is situated at half-forward, for their second and third times respectively. Earning places on the bench in losing sides were talented trio, Eastern Ranges’ Mikala Cann (for the second consecutive week), Murray Bushrangers’ Tamara Smith (third time) and Chloe O’Malley (first time). Gippsland Power’s Jasmine Ferguson was the other unlucky emergency with Caris and Molan who just missed out on making the side. AFTER a week of no TAC Cup Girls football, the players would undoubtedly be keen to get back into a huge round six. 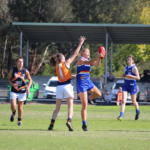 There are plenty of matches that could go either way, including the highly anticipated clash between two top sides in the Geelong Falcons and Eastern Ranges. Meanwhile, Bendigo and Oakleigh will both be searching for their first wins since round one, as they face off at Golden Square. Geelong has brought in its big guns ahead of its clash against the Eastern Ranges. The Falcons have selected all five of their AFLW Academy players, including Eliza Shannon, who has been named as an emergency for the clash. Geelong is still undefeated after five rounds of TAC Cup Girls football and are looking to keep it that way, despite the Ranges bringing in a formidable outfit ahead of the clash at Belmont. The Eastern Ranges experienced their first loss of the season in round five and would be hoping to bounce back in style and stop the Falcons in their tracks. But they will have to do this without star defender, Georgia Macpherson, who will sit out her first game of the season. Eastern’s depth is one of the best in the competition though, so there will be no shortage of talent out on the park as Emerson Woods and Olivia Meagher will come in to bolster the midfield and forward lines. The Power are coming into this game off two consecutive wins and would be aware of the challenge they face to make it three from three in round six. However, co-captain Tyla Hanks will return to the Gippsland line-up this week after having a stellar performance in AFLW Academy colours. Emily Haeusler won our Player of the Week in her last match after a best on ground against Bendigo Pioneers and will be looking to continue that form, while Nikia Webber has been making her way up the goal-kicking tally and could play a big role on Saturday. Webber may find it easier to play her role without Ellie McKenzie playing in defence for the Northern Knights. McKenzie will sit out the round six clash, as well as key players, Neve O’Connor and Ciara Fitzgerald. But the side’s depth continues to pay dividends, as they will boast a forward line that includes joint TAC Cup Girls leading goalkicker, Alyssa Bannan, vice-captain, Magdelene Antypas as well as Alex Pronesti and Nell Morris-Dalton. 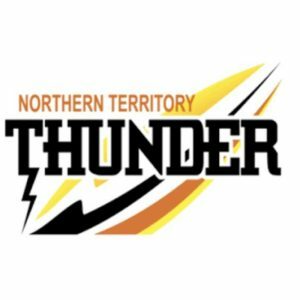 Northern could be in for a big challenge against the impressive Power but would be keen to keep their undefeated streak alive. 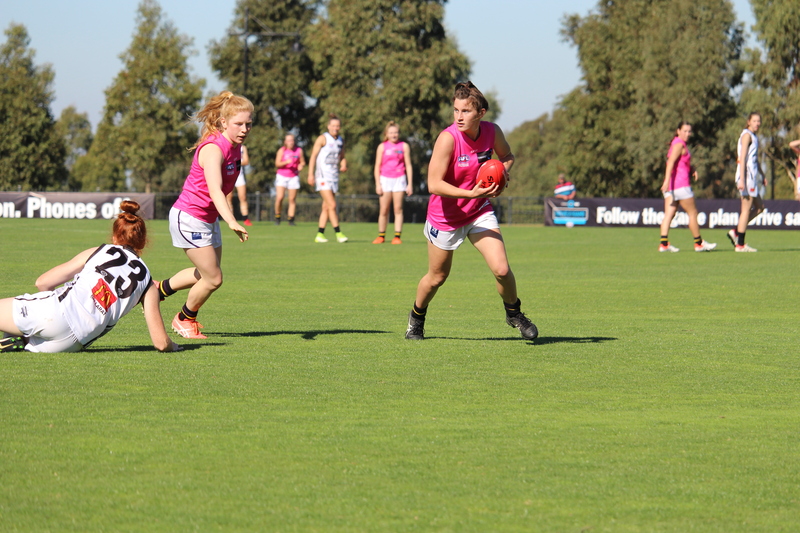 The Murray Bushrangers are going into round six with an unfamiliar feeling, after experiencing their first loss in the TAC Cup Girls competition. The loss of stars such as Rebecca Webster and Millie Brown may have contributed to this, but fortunately, they will be back this round and could dominate in the heart of the contest. Also be sure to keep an eye out for Grace Egan and Tamara Smith, who are coming off fantastic games for Murray. With the Dragons looking as strong as ever, they could be in prime position to really push the Bushrangers at Wangaratta. Eleanor Brown has been playing consistent football and is a key cog in the Sandringham midfield. On Saturday, she will be joined by Abbie McKay, who usually plays in defence. There was an even spread of goal kickers in round five, and these players would be willing to step up again in round six. The forward group of Maddison Wilson, Isabella Eddey, Laura Amelung, Sophia Rothfield, Hannah Bate and Georgia Emberton is one of the strongest forward lines in the competition. The Greater Western Victoria (GWV) Rebels would be hoping to even up their season by recording their third win on the weekend. Their three big guns in Sophie Van De Huevel, Rene Caris and Georgia Clarke will return to the line-up this week after all having solid performances for the AFLW Academy. Meanwhile, Nyakoat Dojiok and Lauren Butler would be hoping to continue their good form for the Rebels. However, this could be harder for them due to some huge ins for the Cannons. Calder welcomes in captain, Madison Prespakis, after she kicked two goals and dominated the contest for the AFLW Academy squad. Fellow AFLW Academy members, Georgia Patrikios and Molly Warburton will also come back into the side to provide some support at the bookends of the ground. Playing her first game of the season will be Emily Vukovic, who is a former Melbourne Tigers youth player, so be sure to keep an eye out for her. The Pioneers last tasted victory against the Western Jets in round one, but came close in a number of encounters. Captain Megan Williamson has starred in every game she has played, while fellow midfielder, Kodi Jacques has been as consistent as ever. Playing at home will be a huge advantage for Bendigo, who will welcome Gemmi Murrell and Grace Sladden into its strong side this round. But the Chargers also have some huge ins with captain, Hannah McLaren and star midfielders, Gemma Lagioia and Chloe O’Malley slotting back into the lineup. McLaren and Lagioia last featured in round four against the Falcons, but only played one quarter due a head clash. They were a big loss for Oakleigh last round, but will be raring to go in their return match on Sunday. With Katie Lynch looking at dangerous as ever in the midfield, it could spell trouble for the Pioneers. The Stingrays welcome in their three AFLW Academy players into the side this week, after they all played wonderfully against Geelong. Brooke Struylaart and Samantha Ryan will slot into the forward line while Jordyn Allen will be looking to dominate in defence. Courtney Jones will start in the midfield alongside Lucinda Cripps, who usually plays in defence. Dandenong have not had a win this season but would be liking its chances at its home ground. 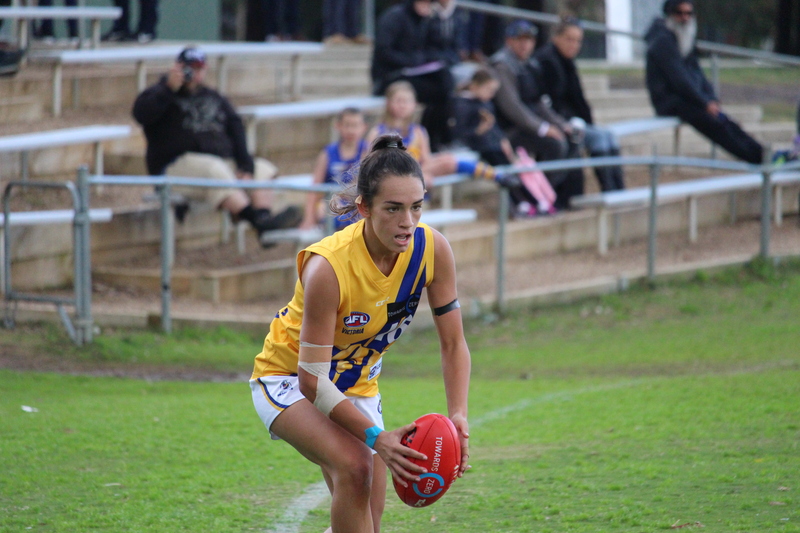 But the Western Jets have come off a great week, after defeating the Eastern Ranges in round five. Forward Caitlin Grieser was dominant in that game with four goals and would be hoping to intimidate the Stingrays defence as she did against the Ranges. Meanwhile, Elisabeth Georgostathis and Payton Ani-Ozols would be keen to continue their red-hot form in the midfield. On Sunday, they will have AFLW Academy member, Isabella Grant to help them out, which is a huge in for the side. THE Story so far continues on from the Country sides, with a review of the TAC Cup Girls Metro sides. There have been plenty of impressive players and team performances across the first five rounds, with one metro team sitting second on the ladder. If the first five rounds are anything to go by, the next four rounds will be full of fantastic battles. The Calder Cannons enjoyed a premiership last season so coming into this year, they would have been hoping to continue their hot run of form. 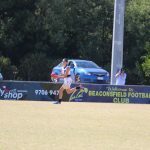 Unfortunately, they did not get off to the start that they would have liked, with heavy defeats against Murray Bushrangers and Northern Knights. But the competition was high as both are top four sides, and Calder were without draftees, Monique Conti, Chloe Molloy and Sarah Dargan, who were integral to their 2017 program. But this year, being the Calder captain has allowed the already talented Madison Prespakis to spread her wings. Prespakis has been unstoppable in the midfield and has really been able to lift her team when needed. She has been complemented by some great young talent in Felicity Theodore, Zoe Hardiman and Grace Dicker, who have all shown great signs throughout the season. The next four weeks could be tough for the Cannons, but with a young side willing to throw everything on the line, expect some close contests to finish off their 2018 campaign. The Eastern Ranges’ season has been spectacular, despite a round five loss against the Jets. 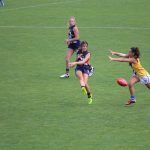 The TAC Cup Girls competition is all about development, meaning losses are often a good learning curve for the players. This is particularly good for the Ranges, who face ladder-leaders, Geelong in round six, where they would love to fix their mistakes from round five and claim a win. Players like Georgia Macpherson and Emerson Woods have been fantastic for Eastern and are showing no signs of slowing down. Forward Laura McClelland is the joint leading goalkicker in the competition with 11 majors, and has been prolific inside 50. In the midfield, it has been Gabriella De Angelis’ quick hands and Mikala Cann’s explosive speed that have been the catalyst behind the Ranges’ admired ability to swiftly penetrate the ball forward. The Northern Knights have been a surprise packet this year, going undefeated so far from five rounds. The wins have been extremely convincing, winning four out of five games by over 30 points. The Knights have an innate ability to burst the game open through one quarter of blistering footy, and leaders such as Madeline Brancatisano, Gabrielle Newton and Britney Gutknecht have been pivotal in these electric passages of play. Abigail Bennett has shown her versatility for the Knights with impressive stints both in the forward-line and in the midfield. Alex Pronesti and Alyssa Bannan have been a dangerous duo inside 50, kicking eight and 11 goals for the season, respectively. The Knights’ lesser-known players have also been standouts, with Ellie McKenzie running amok in each of her three games for the Knights, while Marnie Jarvis has provided fantastic speed throughout the season. Northern’s talent has stood up so far, and will need to continue to do so, as they face their fellow top-four sides in the last rounds of the season. These next four rounds could significantly shape the Knights’ season. The Oakleigh Chargers enjoyed a magnificent win in round one to open their season, however the next four rounds have not been ideal for the Chargers. They have not won a game since, but their development has been good. Gemma Lagioia, Alana Porter and Katie Lynch have been important in the midfield and have stood up when the side has been down. Captain Hannah McLaren has shown great leadership throughout Oakleigh’s 2018 campaign, demonstrating her versatility across the backline and through the middle of the ground. Players like Chloe O’Malley, Mimi Hill and Nicola Xenos have also had convincing performances in patches throughout the season. The Chargers play four of the bottom six teams coming up, in which they can prove a point to the rest of the competition. 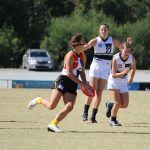 The Sandringham Dragons have plenty of talent in their side, with players like Sarah Hartwig holding up the backline, Eliza McNamara dominating in the midfield, and Maddison Wilson playing well up forward. Eleanor Brown has been damaging all over the ground and has proved that she can have an impact in any position, while captain Jemma Owen has been in fine form of late. The Dragons have now won two consecutive games and have a chance to keep their momentum going against a Murray side who experienced its first loss in the TAC Cup Girls competition in round five. Despite no AFLW Academy members in the side, Sandringham still has the firepower to match it up against the sides that do. It was extremely pleasing to see the Western Jets get their first win of the TAC Cup Girls competition as their development has been positive throughout the season. Isabelle Pritchard has been solid in defence, Isabella Grant can make an impact wherever she plays, and Elisabeth Georgostathis has been sensational through the middle of the ground. Despite four losses to start the season, the losses were not heavy, with the biggest loss coming in round one against Bendigo. But in the last two weeks in particular, we have seen the emergence of forward, Caitlin Greiser. Greiser has kicked seven goals in two rounds and will continue to be a key cog inside 50 as the Jets approach the Stingrays in round six, who are yet to win a game in 2018. ROUND four gave us a new ladder-leader with the Geelong Falcons taking top spot off the Northern Knights. It also saw the Stingrays move off the bottom of the ladder with a commendable performance against the Sandringham Dragons. Meanwhile Gippsland continued its great run of form with a three-point win against reigning premiers, Calder Cannons. This competition just keeps on giving with plenty of great performances on an action-packed Tuesday. Our scouts attended four games from the round. I thought it was the best four-quarter performance I have seen from her this season. She played well inside 50 and just consistently worked her way to the front in marking contests. Jones has a good game sense and knew when to time her leads and use her body to wedge herself between her opponent and the pass coming inside 50. Just kicked the one goal after marking from an Eliza Wilson-Macdonald snap, then missed a chance to make it two after a great lead and mark. Overall a really strong performance. The captain played a typical consistent game, and when called upon, stood up and made it count. She seemed to be everywhere on Tuesday, intercepting and rebounding early, then went forward in the final term and took a huge contested mark, converting the goal and giving the Stingrays a real sniff at victory late in the game. She reads the play so well and is pivotal off half-back. She just knows how to get to the right positions and uses her great vision to not only chop off opposition passes, but open up angles for teammates and find space for them with neat passes. Arguably the Stingrays best across four quarters, her contested work was top notch on Tuesday. You would often find her at the bottom of a pack, shovelling the ball out and no doubt her contested numbers and one percenters would be high from her efforts in the match. Shannon also has good composure with ball-in-hand and is able to stand up in a mark with pressure coming from around her. She took a great intercept mark early in the fourth term, and also had a chance to draw the team within five points late in the match after a quick handball from Lucinda Cripps, but her snap missed. Struylaart kicked the first goal of the game and continually presented up forward. Her game tended to flow like the Stingrays, but when they needed a target inside 50, she was there. Her positioning in the first marking contest was smart, reading the ball’s flight better than her opponent to position herself at the back and take an easy uncontested mark and slot the goal from the goal square. She had a shot in the second term but her snap did not bend back enough. Struylaart also cut the margin back in the fourth term with the opening goal to get the Stingrays up and about. I am yet to see her play a bad game, such is the consistency Cripps has throughout matches. Even when she is not winning the ball, she is contesting and putting her body on the line via blocks, tackles or shepherding – a real team player. She gets to the right positions in the defensive 50 and puts pressure on her opponents, and intercept marks, spoils or just puts her opponents off balance enough to slow play. In the last term Cripps went forward and while she did not win a heap of it, almost changed the game with a lightning handpass to Isabella Shannon as she ran by, but unfortunately the proceeding snap was missed. #1 Shelley Heath: Quieter early, but had some really classy moments. The most noticeable trait for me is her ability to dispose of the ball really quickly. It is hard for opponents to get a hand on her, because she either fires out the handball or puts the ball to boot in record time. A clean user of the ball across the game and clean at ground level. #5 Eloise Allen-Burns: A consistent game playing in defence, taking a crucial intercept mark late in the game and being a rock alongside Cripps in that back 50. #20 Eliza Wilson-Macdonald: A good mover who just cracks in hard at the contest. Had an entertaining battle with Winnie Laing throughout the day when the pair matched up in the midfield with neither player taking a backwards step. Wilson-Macdonald laid a few bone-crunching tackles, and also set up a Courtney Jones goal with a neat turn and snap to the danger zone. #21 Grace Hodder: I was impressed with her game just showing a few signs here and there, laying a huge tackle on the wing and taking a good intercept mark at half-forward. Started to win a bit of the ball through the midfield and was fairly clean too. #28 Tyanna Smith: Had an eye-catching play in the second term, marking and not breaking stride and she bombed long inside 50 to hit up Brooke Struylaart. She then laid a great run down tackle on Abbie McKay later in the match to lock up the ball. The best performance I have seen the Dragons captain put out for the season, she was just everywhere. She not only did all the hard stuff that you are used to with her in-and-under work and fierce tackling, but she broke the lines and made the grandstand wing her own with a couple of daring dashes to burn off opponents and gain serious meterage. She created run off half-back and then seemingly iced the game late in the third term with a huge goal from about 40m out with the kick never looking like missing. She copped a knock in the final term but got back up. A consistent performer across the game, not as noticeable as some, but looking carefully she plays a vital role in the contest. She laid a great goal-saving tackle in the third term, but unfortunately for her the ball spilled free and another opponent kicked truly. Nonetheless her effort in the contest was indicative of her desire at the coal face and produced a strong team player game. I thought her game was the most noticeable I had seen from her despite having some impressive performances this season. She created good drive off half-back and did a few things that indicated her game sense and footy IQ was high – deft taps or knock ons that advantaged either herself or her teammates for the next possession or contest. She also kicked a great goal when all the momentum was with the Stingrays, nailing a shot inside 50 after drifting down there and putting the Dragons nine points up with five minutes remaining in the match. A damaging game from the versatile utility who does not need a lot of space to hurt her opponents. She has a trademark sidestep that opens up space and only needs a split second to compose herself and zero in on the goals. Amelung showed great vision to be able to pick out teammates in pockets of space, and finished the game with two goals – one on the run from 40m out in the first quarter and another from bouncing on a loose ball in the pocket. She also set up a great goal assist to Jemma Owen in the third term who nailed the shot from 40m out. Emberton played up forward and I was impressed with her ability to balance between offensive and defensive mindsets. She would find space and become an option for her teammates going forward, but also put pressure on her opponents so they knew they were being hunted inside their defensive 50. Emberton laid a great run down tackle in the first term for a free kick late, then nailed the set shot from a 45 degree angle. She missed the opportunity to make it two later on, marking in front but the set shot just missed. Emberton moved into the midfield late in the game and found a bit of the ball. #1 Maddison Wilson: Copped a knock in the first term from a tackle, but got back up to compete at the next contest. She reads the play well and is a clean user of the football, and also clean at ground level. #2 Winnie Laing: A contested game from Laing, going head-to-head with Eliza Wilson-Macdonald at times through the midfield, she continued to battle and force her way to contests throughout the match. #25 Isabella Eddey: Kicked a great goal from a snap in the third term to put the Dragons 12 points up. Also had a vital contest backing back into defence in the final term, doing enough to put body contact on Lucinda Cripps to spoil her attempt at a mark, then won the proceeding one-on-one and cleared it out of the danger zone. Zipped around and played her role throughout the game. #32 Sarah Hartwig: Hartwig provided great drive and kept one of the competition’s key goal-scorers – Samantha Ryan – goalless. She has a great ability to change direction and lay some strong tackles, and also provided a crucial intercept midway through the last term, striding out of defence to clear it to the wing. #64 Eliza McNamara: Played even more of an inside role on Tuesday than other matches and looked comfortable. She had to earn every possession this round and did so, well. She has a good turning circle and can work her way out of a stoppage, and almost kicked a great goal in the second half after sidestepping a couple, but was dragged down at the last second and the kick fell short. Harvey was a standout for the Bushrangers, competing hard for the footy and slotting an impressive goal from a tricky angle. She used the footy cleanly and hit her targets. Harvey showcased her fight and desperation for the footy, and took a few really strong marks under heaps of pressure. She was really strong down back and through the middle for the Bushrangers once again. Ashley-Cooper took plenty of strong marks and showed good hustle to win the footy at ground level. She was very clean around the contest and used the footy effectively, showing great awareness with ball in hand. Webster backed up her impressive form again this week gathering plenty of touches and imposing herself on the contest. She was never far from the footy and was a huge influence on her teammates, imposing herself on the stoppages. She had clean hands in and around the contest and used the footy well. Webster laid plenty of strong tackles and showcased her ability to run and carry with the footy. Not only did she tackle well but she used her strength to burst away from the packs and help set up forward play for her team. 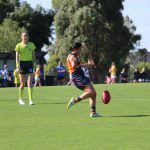 She showed great awareness with ball in hand and demonstrated her long penetrating kick, scoring a goal herself in another strong performance for the Bushrangers. Brown had a huge first quarter for the Bushrangers. She showcased her class and footy skill nailing two big goals in the opening term and demonstrated good awareness with ball in hand. Brown used her evasive skills to get into damaging positions and used her booming kick to propel her team forward. She also took big grabs throughout the match. Smith showed some good fight and competed hard to win the footy. She was never far from the contest and laid plenty of good strong tackles throughout the match. Smith applied good forward pressure to lock the ball in their forward 50 and used the footy cleanly, hitting targets with pin-point accuracy. In and around stoppages she was really clean and helped to open up the space with her dash. #4 Chelsea Knight: Knight showcased her marking ability and competed hard for the footy throughout the match. She ran hard and was not afraid to impose herself on the contest. #5 Chelsea Hargreaves: Hargreaves took plenty of good intercept marks and had really strong hands under heaps of pressure. #11 Ada Chessor: Chessor showcased her clean hands around the contest and used her break-away speed to open up the field. Her ability to win the in and under ball allowed her to use skills to burst away from the pack. #26 Emily Nicholson: Nicholson laid a huge tackle in the third quarter and took a few good intercept marks throughout the match. #37 Sophie Damon: Damon was really solid down back for the Bushrangers and competed hard at the contest. She laid an impressive smother and helped to propel her team forward multiple times from defence. #42 Grace Egan: Egan backed up her strong performance last week with another consistent game, taking plenty of strong intercept marks and impressing with her ability to read the flight of the footy and the play of the game. #45 Olivia Barber: Barber took plenty of good contested marks and rucked really well for the Bushrangers. She won plenty of the ruck contests and took a strong good grab. Barber nailed an impressive goal in the third quarter. Gashi was a standout for the Jets showcasing her impressive speed and evasive skills. She was very clever with ball in hand and used the footy effectively and efficiently. Her run and carry was important to help propel her team forward and she used her strong kicking ability to set her team up. Gardner was good around the contest and competed hard to win the footy for her team. She was never far from the contest and was not afraid to get involved in the thick of it. She had clean hands and picked up the footy with ease. Grant showed some good dash across the ground and took a few running bounces to try and open up space for her team. She set up plenty of play in the forward 50 and competed hard for the footy at ground level. She took a big mark in the second quarter and competed hard for the ball throughout the whole match. Negri was a key presence up forward for the Jets and used the ball relatively well. Negri was not afraid to go hard at the footy. Her quick release with ball in hand helped her team mates and allowed them to run into space. She was the sole goal-kicker for the Jets bagging three majors. Greiser impressed with her accuracy in front of goal and showed good composure with ball in hand. She moved well across the ground and got herself into damaging positions in order to set up shots at goal. Greiser was a key figure on the ground and looked dangerous in front of goal. #19 Olivia Forsythe: Forsythe laid some good strong tackles and used her long penetrating kick to help her team get out of trouble. She showed great awareness and helped to set up some forward play for the Jets. #21 Maddison-Eve Fenech: She applied some good tackling pressure and fought hard to win the footy. #40 Sharnie Whiting: She was effective down back for the Jets and had a beautiful long kick which she used to help propel her team forward. She set up play defensively and was able to hit targets on the kick in. #44 Carle Myors-Moore: She was really strong down back for the Jets and soaked up a lot of pressure from the Bushrangers. She used her long clearing kick to get the ball out of their defensive 50. She is quite classy in tight and has time when her opposition has none. She has good hands for and can hold her marks when under heavy duress. She is really trustworthy on the last line of defence when needed to mark under pressure. Her ability to play anywhere on the field is a strength. She seemed to be everywhere in the first quarter. She had a presence on the ground which the Rebels could not contain early on. She kicked an impressive goal late in the third term as she was getting tackled, which shows great composure. She played as the main target for the Knights in the forward line, presented well and was rewarded for constant hard work in the first quarter with a goal, which she converted from a set shot 20m out. She converted her second from a similar distance moments later, as she stamped her authority on the game. Her hands did not falter as the game went on. She managed to hold her own as a key position back and took impressive marks when the team needed her. She is often the player that her teammates look to when distributing the ball. #3 Nell Morris-Dalton: She has great hands and leads very well. #10 Phoebe Chisolm: Chisolm displayed her tackling power with a great chase-down tackle in the first term. #17 Ciara Fitzgerald: She seems a class above with her speed out of the stoppages. #23 Gabby Newton: Newton was a key interceptor for the Knights in the backline, continuing her form this season. #22 Britney Gutknecht: She is a quality on-baller who disposes the ball well out of the contest. For a backline player, she was able to convert from a long distance after she was a awarded a free and 50m penalty for rough conduct, which illustrates great flexibility for the 18-year-old. Definitely one of the Rebels’ best on the day. She snapped through a very nice goal from the boundary which showed great promise as a small forward. Afterwards she showed a bit of character which was good to see, as she brought her team within one point of the Knights in the second term. She was lively throughout the whole game and a real standout for the Rebels. Molan is a very accurate shot for a goal as she converted from 30m out in the second term after being awarded a free kick for holding. She continues to improve as the season goes on, being one of GWV’s most consistent players. Molan was a strong defender early in the season but has made her mark in attack the last few weeks. Her dash and accurate kicking across half-back was instrumental in attacks for the Rebels. Her pressure on the ball-carrier was immense. She proved this by winning multiple frees. Clarke backed up her best-on-ground efforts last week with another sterling game in defence. She has really good pace and runs all day up and down the wing. Late in the last quarter she sprinted away and kicked her first goal for the match in a good quarter of forward athleticism. #13 Chloe Leonard: She was able to finish nicely in front of goal as she kicked truly for her second-term major. Did some really nice things on the day and was one of the Chargers players who never gave up. At times, she would pick the ball up quickly and kick it out of congestion, displaying her great spatial awareness. She also displayed clean hands throughout the day. Was a key link in the chain for the Chargers throughout the day. Has a great long and penetrating kick, which was even executed well on the run. She had great balance to kick the ball well and keep her feet while Geelong players were chasing her down. Had the ability to get and go throughout the whole game to try and hack the ball forward for her side. Took a great in and under mark, laid a goal-saving tackle, and completed a huge run-down tackle to save Geelong running forward. A complete game from her. Made the clubroom end her own by always getting the ball in that area and hacking it out of congestion off the half-back line. Often marked, and kicked towards the wing to create space. She was proactive in finding other ways to get her team moving forward. In one instance she had the awareness to kick across the ground to allow her team control the footy. Was able to accelerate and kick on the run. Read the game really well. Got plenty of the footy on the day. Dug in deep for the side, trying to hold down the fort in defence then presenting herself in one instance in the forward line. Had good agility to evade a tackle at one point and kept trying to surge forward. Constantly went in hard for the footy and when she got it, she had the composure to go back, look for a target and allow her teammates to get into position. Another commendable performance from Moon, she is a very consistent player. She showed her strength with a good pick-up off the deck while she had a player on her back. She is proving to be very important for Oakleigh. She was one of their better players on the day and seems to be improving as each week goes on. In one instance she burst from the last line of defence, cleared the ball from goal-square congestion and took it to the wing. Backed up last week’s solid performance. #14 Hannah McLaren: Penetrating kick and was getting plenty of the footy in the first quarter. Went off with a head knock towards the end of the term and did not come back on which was a shame. Looked like she was going to have a solid performance. #11 Bridie Winbanks: Did well in the ruck to minimise Inei’s influence. Kicked the ball nice and high at times to allow her smaller teammates to run onto the ball. Got plenty of air on her kicks. #30 Gemma Lagioia: Started the game incredibly well before an unfortunate head clash with Hannah McLaren. Won plenty of the ball and kept it moving in the short time she was out there. #39 Tayla Nichols: Took a good intercept mark and laid a goal-saving tackle on the last line of defence to prevent a Geelong goal. #43 Emily Hastie: Laid an excellent rundown tackle and took a good mark from a defensive kick inside 50. Was everywhere throughout the day. Had a good clearance out of the centre and was able to burst through congestion multiple times. Was able to pick up the ball cleanly and it paid dividends when she did it inside 50 and slotted through a goal. Her marking power was remarkable for such a small player. Took a good leap over a player’s back and took a mark with an opponent on her back, showing she could do it all. Was another Falcon who had a wonderful goal sense. She was Geelong’s best player on the day. Displayed electric speed throughout the game. She is such a composed player. Morrison is also a confident player, shown when she ran along the boundary line and kicked a brave snap. She has a good kick off one step, and has one of the most diverse kicks I’ve seen this year. Can kick it high, low, or spear a pass. In one instance, she kicked a low ball into the forward line, as she picked a target rather than just hacking it to the top of the goal square. So good at finding targets and has an innate ability to lower her eyes to control the flow of the game for the Falcons. Flexed her muscles against the Chargers. She plucked many marks out of contests and was able to clear the ball, whether it was by giving the ball off or running into space herself. Took a huge contested mark with a contest of players behind her. At one point she had good game sense to cleverly tap the ball in a contest which allowed her to run forward. She displayed good kicking up forward and had a strong presence inside 50. Kicked a nice goal to solidify her dominance. Always knew how to bring her teammates into the game with quick-fire handballs. In one instance, she got a kick away even though she was being tackled. Good acceleration. Got heaps of the footy throughout the day. Has a long kick which got Geelong out of trouble deep in defence. Had a great knack to pick up the footy and kick off one step to boot it forward. Kicked four brilliant goals for the day. Always ran into the right spots to run onto the end of some long kicks inside 50. For one of her goals, she read McEvoy’s quick pick-up, grabbed the ball off the deck and snapped it around her body. Kicked a good goal off a free kick with a nice calm run up. Took an excellent pack mark at the top of the square. She was really lively inside 50 throughout the whole game but her influence was especially felt in the third quarter when she kicked two goals. Has a remarkable goal sense. #9 Luka Lesosky-Hay: Had a nice long kick into the forward line and created a couple of forward thrusts. Kicked to the ball beautifully to the perfect spot, the goal square, to allow the small forwards to run onto a loose ball. Kicked a goal herself to polish off a nice day out. #11 Kaitlyn Haustorfer: In one instance she cleverly tapped the ball under pressure to get it out of the congested stoppage. Laid a great tackle and got straight back up to continue chasing. #14 Tarryn Love: Great mark and good ability to play on. #19 Zoe Inei: Nice goal from a free kick, curled it nicely. #22 Mia Sheppard: Good effort to get the ball, kick it then follow up her kick. Kept her feet well throughout the game. #30 Emily Allan: Read the play well to get the ball out the back off a big kick inside 50. Kicked a nice goal to finish it off.